Marketing tactics come and go. If you’re selling marketing services, here’s how you can stay relevant. Agency Spotter, a website that lets marketers search and find marketing agencies, released their 4th annual Marketing Trends Reports. The data is based on the searches that happen at their site, which numbered above 250,000 last year from more than 160 countries. 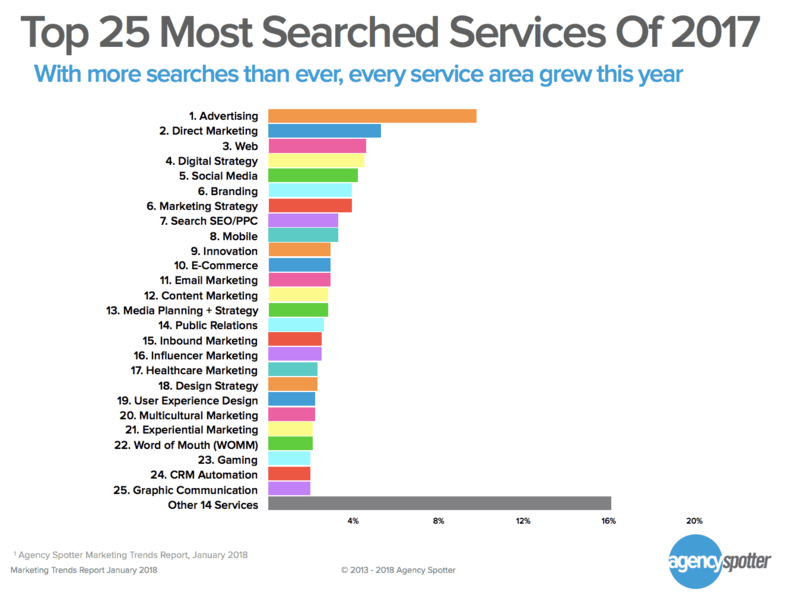 Professionals who are searching for marketing services on the site are varied — ranging from small businesses to F500 companies, CMOs, and front-line marketers. You can download the full report from Agency Spotter here. Based on their data, there is clearly no service that rules them all. While advertising holds the top spot, no service represented more than 12% of the total. But, when the Agency Spotter team dug a bit deeper into trends, they noticed that digital marketing practices have garnered a larger percentage of searches over the last few years. 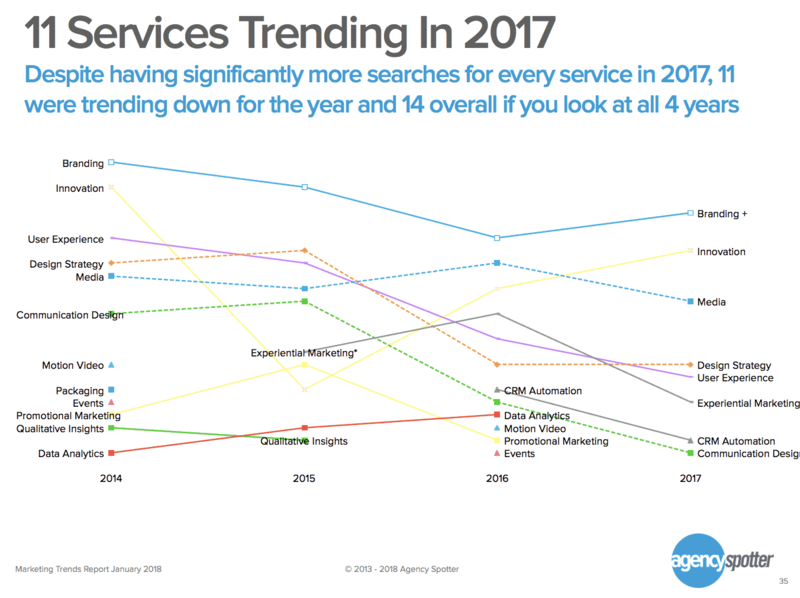 The research from this year compares each tactics ‘search popularity’ over the past 4 years to show which services have seen an increase in searches. The services that have climbed higher on the list include a bunch of digital marketing tactics including Web, Email, Search (SEO/PPC), Ecommerce, Content Marketing and Inbound marketing. On the flip side, many of the services like Branding, Design strategy, Communication design, and UX–that traditional agencies have relied upon as their bread and better–are beginning to slip in search volume. At Databox, we see many of these similar trends. By the nature of our business, we attract data-driven, goal-focused and tech-enabled marketers and agencies. They are investing more and more in marketing tactics that are measurable and can be improved. 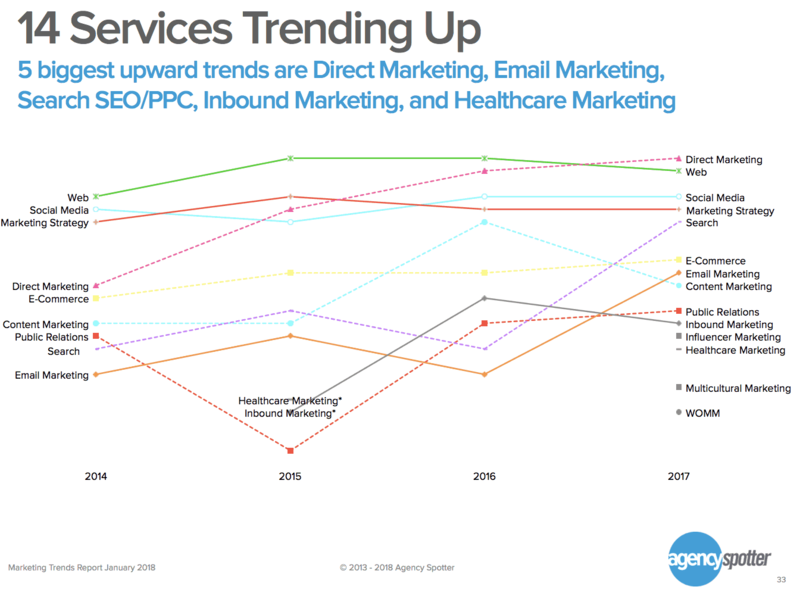 Marketers, what services are you searching for? Agencies, what are you selling? Does this data make you reconsider what you’re doing? Or validate it? Download the full report from Agency Spotter here once you create an account.